It’s an ironic incongruity: the Pacific Northwest appellation with the fewest regularly open tasting rooms (only three of them) is the source of a quarter of Washington State’s wine grapes—and has contributed to the most 100 point-scoring Northwest wines. The Horse Heaven Hills AVA may not yet be wine touring paradise, but for wine grapes, it may be Elysium. The Horse Heaven Hills AVA is a 50-mile wide by 20-mile deep swath of land between the Yakima Valley AVA and the Columbia River. The hills slope up from the river’s north bank from 300 feet. elevation to 1,800 feet, just south of the Yakima River. Standing on the veranda at McKinley Springs winery, deep in the heart of the appellation, one can appreciate why this expanse of land was once considered heaven for horses: it is a vast, unencumbered territory where a horse could cavort without barriers. The natural land is open, sparse, dry, windswept, and hot in the summer. But add water for irrigation, and the scant ground becomes abundant. 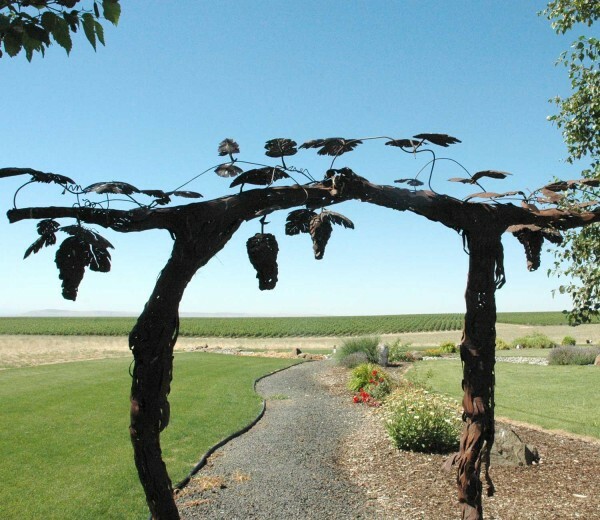 McKinley Springs overlooks 2,000 acres of estate vines in the Horse heaven Hills. Don Mercer planted the first wine grapes here in 1972 (the Mercer family is still a major grower in the region) with a plan to rival Bordeaux—a valiant vision for those early years. The original 7-acre block of cabernet sauvignon is among the oldest still-producing plantings in the state. Paul Champoux, an early vineyard manager, eventually leased the land and formed a partnership with the wineries Andrew Will, Quilceda Creek, Woodward Canyon, and Powers to purchase what is now known as Champoux Vineyard. Under Champoux’s direction, the vineyard has grown to over 180 acres with 11 varieties, and has garnered a reputation as one of North America’s outstanding vineyards. In particular, Champoux Vineyard grapes were used in the four “perfect” 100-point wines as scored by Robert M. Parker’s, The Wine Advocate. These were Quilceda Creek’s 2002, 2003, 2005, and 2007 Cabernet Sauvignon wines. Such recognition has brought renewed respect for the AVA, but even without these high-scoring standouts the appellation was in great demand for its combination of beneficial growing conditions and large-scale vineyards yielding ample, affordable, well-grown fruit. The soils are excellent for grape vines: well-drained combinations of windblown silts and sand, with inclusions of glacial sediments, alluvium, volcanic ash, and decomposed basalts. 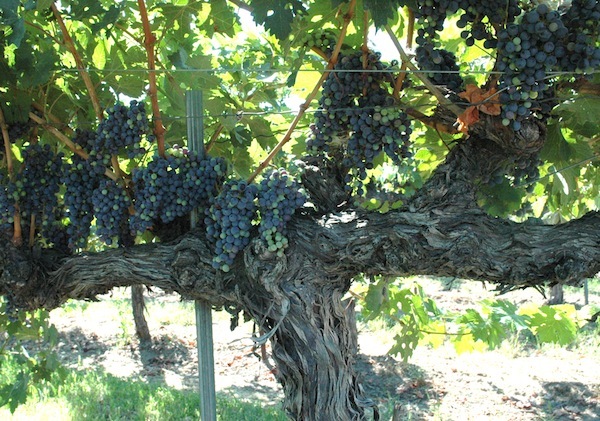 The relatively warm temperatures (Growing Degree Days average 3,000), exceptional dryness (annual precipitation is 2-9 inches, mostly all in winter), and constant wind from the river (30% more than any other Washington AVA) puts a natural brake to vine vigor and nearly eliminates disease pressure. The Benches, a vineyard owned by investors in Long Shadows Vintners, including Allen Shoup, is a spectacular Horse heaven Hills site along the Columbia River, supplying grapes to many producers. It is no wonder that 25% of Washington’s entire wine grape production comes from the approximately 11,000 acres of vineyards in Horse Heaven Hills. Or, that the single largest winery in the Northwest, Columbia Crest Winery, is located here. Yet despite its significance to the Washington wine industry, touring in the Horse Heaven Hills is problematic. This isn’t wine tasting country; it’s wine growing country. Only Columbia Crest and Canoe Ridge Estate (both owned by Ste. Michelle Wine Estates) plus McKinley Springs Winery, maintain regular tasting room hours during the season. Alexandria Nicole Cellars and Chateau Champoux have facilities here also, but require advance arrangements to visit. However, tasting wines made from Horse Heaven Hills fruit is easy, since so many producers use fruit from the AVA. For red varieties — 67% of the appellation’s production — notable producers include Quilceda Creek, Andrew Will, Alexandria Nicole, Mercer Estates, Buty, Gino Cuneo Cellars, Coyote Canyon, Martinez & Martinez, Woodward Canyon, Long Shadows, Den Hoed, Fidélitas, Soos Creek, Chateau Ste. Michelle, Columbia Crest, Januik, and many others. Horse Heaven Hills red wines are notable for their supple textures. While well-structured tannins are an ever-present result of grape skins toughened by the constant winds, they are almost always soft fruit tannins and possess a plush, velvety quality in the mouth. Fruit expression is rich and varietally quite pure, freshened by good, natural acidity, and surrounded by accents of minerality. Some have characterized Horse Heaven Hills reds—particularly the Bordeaux blends—as occupying a middle ground between the lean firmness of Old World expressions and the fruity lushness of California. White varieties also thrive. Though they comprise only 33% of total production, they are highly sought after. In particular, riesling, chardonnay, and the less frequently encountered chenin blanc are popular. Large diurnal swings mean white grapes retain strong acidity that helps showcase varietally true flavors. Excellent examples of this include Rieslings from Pacific Rim, Poet’s Leap Riesling from Long Shadows, the Chenin Blanc made by McKinley Springs, and Chateau Ste. Michelle’s 2012 Mimi Chardonnay. 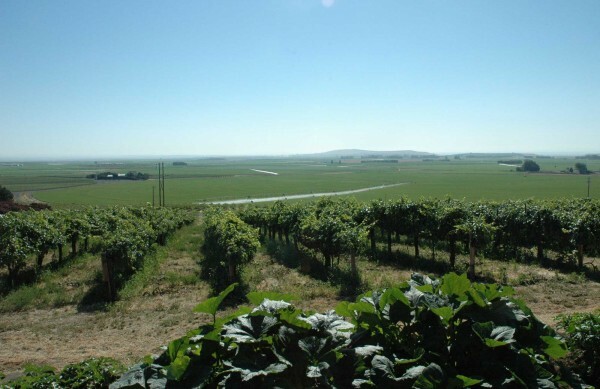 Despite the vast scale, the sense that when you stand at the high point in a Horse Heaven Hills vineyard it seems there is nothing but grape vines reaching to the horizon, this is a very personal wine appellation. Ask the growers about their history, and soon you realize that a handful of family names weave throughout the years and the vines like a temporal trellis connecting the whole AVA, and nothing is as industrial as it seems. A visit to Martinez & Martinez Vineyard brings it all home. Sergio Martinez began working with vinifera after his family emigrated from Mexico to California when he was young. Sergio and Kristy planted their own Horse Heaven Hills vineyard in a distinctive mesoclimate called Phinny Hill in 1981. The Martinez vines are direct descendants of the first cabernet sauvignon planted in the AVA by Don Mercer, also at Phinny Hill. Today, son Andrew and his wife Monica help grow the vines, make the wine, and manage the business. As a group of us sat on the lawn outside the modest Martinez family home, tasting their polished Cabernet Sauvignon and gazing out at the expanse of irrigated land in the distance, Paul Champoux stopped by and was warmly greeted by the family. Rob Mercer also showed up, and the conversation quickly moved to the early state of the 2013 vintage. The wine in our glasses was intense, yet generous—much like the people who grew it and made it. It tasted of the place: bright, open, refined, cultivated; and it spoke of the people: sincere, authentic, dedicated, fervent. The view from Martinez & Martinez’s vines, with Chateais Champoux in the distance at left. 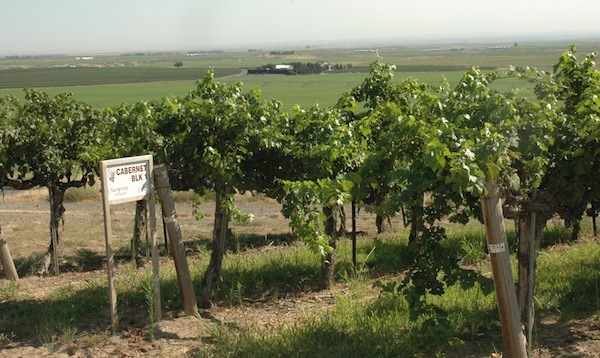 Martinez & Martinez may be the first Hispanic-owned vineyard in the state, and the winery is only the second Hispanic-owned winery in Washington. Cole Danehower is an award-winning writer, editor, and publisher who has been reporting on the Pacific Northwest’s dynamic wine, spirits, and culinary travel scene since 1998. In 2010 Cole’s book Essential Wines and Wineries of the Pacific Northwest, A Guide to the Wine Countries of Washington, Oregon, British Columbia, and Idaho was published by Timber Press. In 2013 Cole began publishing a new regional wine website, Essential Northwest Wines that includes Northwest wine feature stories and profiles, in-depth wine reviews, and his blog. Cole, I just had the pleasure of reading your article about the Horse Heaven Hills appellation, “The Grape Heaven of Horse Heaven Hills”. Thanks for capturing the essence of one of our great our great grape growing regions in Washington State. Great writing and great pictures too.